In its final and most virulent strain, Anti-Semitism is once again pandemic. It’s on the rise in Europe, in Asia, and in the United States. Most shockingly, it is on the rise on college campuses and in main-line Christian denominations. In twenty-first Century politically correct parlance this most ancient hatred for Israel and the Jewish people is now referred to as anti-Zionism. But I am not here to tell you how Islam is fanning the flames of anti-Semitism. Most of the readers frequenting Bulldozerfaith.com are quite aware of this growing menace. So I will not waste time appalling you with all the atrocities being committed. Instead, I want to inspire you. That’s right–inspire you with some little-known history. Anyone who’s watched Schindler’s List knows that the State of Israel honors Gentiles who risked their lives to save Jews during the Holocaust. They call them: khassidey umot ha-olam–“the righteous of the world’s nations.” But what I bet you don’t know is that during World War II, one small occupied nation saved 7,000 of its 7,500 Jews over the month of October in 1943. What made the feat truly a miracle was its spontaneity. While Flem and Liesel’s love story is fiction, the greater love story—that of ordinary Danes for their fellow citizens—is pure history. Miracle Across the Sound dramatizes their fearless and selfless actions. Ordinary folks, from ambulance drivers to Lutheran pastors, courageous men like George F. Duckwitz and distinguished men like physicist Niles Bohr, gloriously stood up to evil and shouted, “No!” in October of 1943. Their awe-inspiring, yet little known, history must be told. That is why I wrote Miracle Across the Sound. But there is one other reason I wrote this novel; I want to start a new line of Christian Fiction, one with characters who understand that Yeshua did not come to start a brand new religion. While the bulk of this article will focus on the historical facts I wove into the fictional storyline, at the very end, I’ll include an excerpt of the scene in which Flem tells his father about his faith in Yeshua. In 1939, Germany signed a non-aggression pact with King Christian of Denmark, who foolishly failed to fortify the country’s border with Germany, not that it would have done much good. Then, in the wee hours of April 9, 1940, as German paratroopers rained from the sky, German soldiers docked at Langelinie Pier, and by 4 a.m., Hitler’s troops marched into Jutland. As the Danish Army engaged in a brief skirmish, the Royal Guard defended Amalienborg Castle. Thirteen died. Twenty-three were wounded, and the Danish Navy did absolutely nothing. Resistance would be suicidal. Denmark, unlike its mountainous neighbors, was flat. Fighters had nowhere to flee, nowhere to hide. So the King surrendered. But while Parliament was entering into a policy of negotiation with their German occupiers, Denmark’s merchant seamen were disobeying orders. Instead of sailing to neutral ports, they joined the Allied Forces. And thus began Denmark’s occupation. But the finish of a race is more important than its start. And to properly understand what happened three years later, during the fall of 1943, one must know some Danish history. As far back as 1690, while most of Europe was persecuting Jews, Denmark’s Parliament fired one of its police chiefs for merely suggesting Denmark do likewise. Only that wasn’t enough. The Danish Parliament, adamant about civil and religious freedoms, went one step further. They wrote a resolution condemning ghettoes as inhuman. And so, three years after the occupation, while Jews in other German-occupied lands were rotting in ghettoes, stripped of their humanity, or dying in concentration camps, stripped of their very lives, Denmark’s Jewish citizens were still free. Civil and religious rights were a part of Danish history. It was in their blood. It defined who they were. One bold college student, right under the noses of the Gestapo, requested audience participation one afternoon at a song-fest in Gjorslev. The crowd was asked to sing two national anthems. The first was Denmark’s own—no surprise there. The second one caused the Reich’s dignitaries to fall out of their seats. The students stood, and as the Zionist flag was unfurled, the students belted out the lyrics to Hatikvah. In the international press, the Danes became known as Hitler’s pampered canary. But while the Danes insisted on civil rights, they complied with working hard on the farms and factories to provide for Hitler’s war machine–at least on the surface. Without fighters hiding out in non-existent mountains, Danes resisted the only way possible: with strikes and sabotage. Both were up in the summer of 1943, and Hitler was fit to be tied. He wanted Denmark’s Jews rounded up. On August 29, 1943, Berlin demanded an end to all Danish resistance. Public gatherings were prohibited, a curfew enacted, and press censorship imposed. Firearms and explosives were to be surrendered before September 1st. Those found in possession of them, as well as all saboteurs were to be executed. 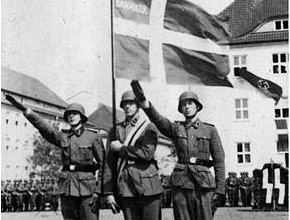 Harassment of Danes who were cooperating with the Germans would no longer be tolerated. Special tribunals to deal with infringements of the new laws were established, and the severest punishments enacted. The Danish Parliament resigned, refusing to meet Berlin’s demands. So Germany took over, and enforced martial law. Wanting to implement Hitler’s “Final Solution”, plans were made to round up Denmark’s Jews in a surprise raid to commence on Rosh Hashanah. Their plan might have worked had it not been for a German named Georg F. Duckwitz, who had been living in Copenhagen for several years, and was the head of German shipping. George had heard about the raid first hand from Germany’s civilian administrator in Denmark, Dr. Werner Best, and had been agonizing for weeks about what he should do. George made his decision once the ships were in the harbor. He knew in just over twenty-four hours, on October 1st, the raid would begin. Thus the miracle began. Hans Hedtoft immediately warned C.B. Henriques, the head the Jewish Community, as well as Dr. Marcus Melchior, the acting chief Rabbi. Word that the Jews were to be rounded up for deportation to a concentration camp spread like wildfire. Only those few unwilling to believe an atrocity of this magnitude could happen in Denmark stayed, along with those who were too old or too sick. Everyone else went into hiding, sheltered by friends, neighbors, and total strangers, Danes who refused to allow evil to triumph. When door after door had been kicked in by jackbooted S.S. men armed with howitzers, only a handful of Jews were arrested. And over the month of October of 1943, they were smuggled across the sound to neutral Sweden in fishing boats. While in Germany Lutherans were part of the problem, in Denmark Lutherans were the solution. They loved their (Jewish) neighbors as themselves, in word and in deed. One Lutheran pastor stored a TORAH scroll in the basement of his church until after the war. And on October 3rd, pastors in every Lutheran church throughout Denmark, read–from the pulpit–a letter denouncing Germany’s round up of the Jews. By the end of October, 7,000 of Denmark’s 7,500 Jewish citizens had made it safely across the Sound to Sweden. Only 500 Danish Jews got deported to Theresienstadt concentration camp in Czechoslovakia. And all but 51 of those sent to Theresienstadt survived the Holocaust. Why? Because Danish officials pressured the Germans with their concerns for the well-being of their Jewish citizens. They demanded that they be allowed to send care packages to the Danish Jews in the camp, and just like in Yeshua’s parable of the unjust judge, Germany acquiesced. Although I could go on and on with inspiring tidbits, I will stop, in the hopes that you will go to Amazon and buy my book, Miracle Across the Sound. Flem found his father in the parlor, seated in his usual chair. But unlike other nights his father’s feet were not up on the hassock. He sat rigid. The mystery Flem expected to find his father’s nose buried in lay page-side down on his lap. “We need to talk,” Flem said. His father stopped staring at the flame in the fireplace and peered at Flem over his spectacles. Flem shut the double doors, not wanting his mother and Inger to eavesdrop, then dragged a chair in front of his father’s and sat down. His father stared back in silence. Still, his father said nothing. Nothing but silence. Deadening silence. Not so much as a blink. Flem couldn’t believe his ears. Where was this nonsense coming from? Inger! Of course! Flem should’ve known. He never should’ve trusted her. But he’d have to deal with the squealing little monkey later. It is such a Great read !!!! It is inspirational as it unfolds the historical truth of people coming together to risk their own lives to save the Jewish people during WWII persecution. Get this Book ASAP !!! You will enjoy the fictional characters woven together with the historical heroes !!! Thanks Christine Egbert for writing this wonderful Historical Fiction !!! I would never have known about these Special Danes had it not been for you and your passion to write !!! Looking Very Forward to reading more of your Books !! !